This excerpt, beginning on page 422, immediately follows the last excerpt, in which I agreed to help Elena write her memoir. Now, for the first time, I began to apply my technique of character observation to a living person—my own daughter. The results surprised me. Elena lit up with real excitement for the first time in months. “Let’s start right now!” she said. “Get your laptop.” And she came over to sit on my bed. I picked up my laptop and sat down facing her. I couldn’t help but feel touched at her faith in me. She really thought I could do this! So I opened up the laptop, and I thought about my daughter as if she weren’t my daughter—as if she were one of my characters instead. What did I need to know? What? Almost every meal? Oh my God! That was the mother in me. I could feel the panic and hurt clawing my chest. I could feel that helpless Victorian mother, wringing her hands and whimpering out her protests: All those pizzas I ordered for you? The cake I made that you used to love? Why? Why do you do this to me? Why do you hate me so much? But the writer in me couldn’t help but feel fascinated. And it was the writer who spoke. Purging right next to me in a restroom stall? Carrying on a conversation and vomiting? My stomach twisted, but I fought down my feelings of disgust. Notice the cool poise, the writer in me pointed out. My character is speaking with real confidence. This is a skill she’s mastered, and she’s proud of that skill. It makes up part of her hidden world. I wanted to shove this idea away with both hands and then stomp on it. But instead, I forced myself to be fair. My mind ran through this imaginary scene. As much as I didn’t want to watch it happen, I could see the comfort my character was taking from it. She’d been raised on small rituals—the Sign of the Cross, grace before meals. And she liked them. Elena had OCD. But then . . . I could feel my own throat tighten up. I felt water gather in my eyes. “But you’re getting ready to gag,” I pointed out. “Not really for me,” Elena said casually. That squashed my mental image. My scene was wrong. I had to pay attention. I was silent. More and more, I let this realization sink in: My character worked very hard at this. She is a pro. The realization began to bear fruit. I caught glimpses of my character, younger, worrying about her nails, practicing to get this right . . . And ripping off fake nails when she ruined them? No wonder I’d seen her yanking off her French nails! The mom in me was standing by, mourning, wringing her hands, but the writer in me was hard at work now. The writer knew that only by watching, only by paying attention, would I gain that true awareness of character. One small trait would reveal another. This couldn’t be rushed or interfered with. I’d only learned about my character Miranda’s cutting by paying attention to the look in her eyes when she noticed a scrape. Now, Elena was ticking off techniques, informative and practical, like a seasoned guide giving a lecture to a tourist. Okay, I had to admit, that was clever. Gross—horribly gross! But clever. “It sounds very scientific,” I said. She was sounding so relaxed but so animated right now. I must have sounded like that when I was lecturing Susan on folklore. This was something very close to this character I was studying, very safe for her. More addictive than nicotine? Wait a minute! How could that be right? Okay, that was just plain crazy! I couldn’t understand it at all. Or . . . could I? My imagination brought me feelings from when I had been very nervous. I could remember my stomach feeling so unsettled that I thought I was going to throw up. If those nervous feelings were very intense, day after day, never letting go—and I thought of that Critical Voice, yelling down its vulgarities and insults—wouldn’t I try anything I could to find a little relief? No! said the mother in me. No, no, no! Think of the waste! Think of the nasty acidic old used food! And I felt my stomach give a lurch. “But still, vomiting . . . ,” I protested. Control. I thought about that. I thought about this hidden skill, this secret sense of control. But then I thought about something else. But how hidden had it been, really? Did they lie to me? demanded the mom. Quieted, the mom settled down, and the writer took over again. In my imagination, I saw my character going through her daily life, using her body like a mask, like a shield. She was watching over its details in order not to give away the secret life going on inside . . . But at the same time, sadness was starting to well up inside me. It was exhausting, this strange new world I was having to see. “Did you tell Dr. Petras?” I asked. “Is that why he diagnosed you anorexic and put you in the hospital?” And, even though I tried my best to stay in my writer’s mind, I fidgeted at the thought. This was still a sore point with me. I couldn’t help it. I just despised that man! Lucky?! shrieked the mom. But I shut her down. Elena and I worked all evening. She talked while I took notes, and if she wasn’t as vivacious and alert as the old Elena, she fought off the sedation more effectively than she’d done in weeks. Then she took her evening pills and vanished into sleep while I lay awake, studying my notes. This is amazing! I thought in a rush of excitement. She’s really committed to this! She really is letting me into her world. But it was a creepy world, a world that made my skin crawl. I thought of the Critical Voice, harping away day and night. I thought of vomiting, turned into an addictive pleasure. I thought of teeth and nails, not as parts of a regular person, but as a kind of disguise instead. I thought of doctors, not as professionals who healed and helped, but as bumbling detectives to be fooled and put on the wrong trail. Nothing that I touched in this new world was turning out to be the way I thought it would. A normal person couldn’t survive here for five minutes. My imagination called up scenes to show me, building them out of the comments tonight and out of the bits of information I’d learned over the years. Before, this information had been a source of worry for me. Now, it gave me important clues. I needed to see this strange new place. I needed to learn about the character who lived there. Toilets became faithful allies in the quest for independence. Trash cans guarded secrets. Kitchens became a frightening, bewildering muddle. This was a misty place, where details blurred and scenes swam in the fog of perpetual starvation—a fog I could relate to from my experience of serious blood loss. Touch and feeling, I remembered, had become stronger and more reliable than vision. Over time, touch must start to supplement sight in this foggy world. Touch. Hands wrapped around the thigh meant victory. Hunger pangs meant reassurance. The curve of the collarbone turned into a kind of worry stone, to be touched and rubbed again and again. Gingerly, I tested out my theories about this dim world, which rippled with unforeseen dangers and unusual suggestions. It was an austere place, that I could easily understand. There was no abundance here of any kind. Everything had to be measured out and rationed, from food to action to breath. Little by little, the world I was building began to feel like the undersea world of the mermaids Elena loved so much. This was a lesser world. It was a fragile, attenuated existence. It survived on borrowed light. It was such a hard place for the delicate creature who drifted through it! No wonder so many of her brothers and sisters ended up dead. Text copyright 2015 by Clare B. Dunkle; text courtesy of Chronicle Books. 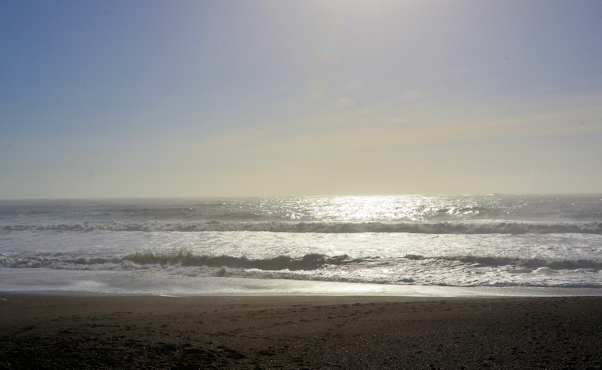 Photo of the Pacific Ocean near San Francisco Bay by Joseph R. Dunkle, copyright 2016. To read my latest blog posts, please click on the “Green and Pleasant Land” logo at the top of this page. This entry was posted in Anorexia nervosa, Characters, Elena Vanishing, Writing craft. Bookmark the permalink.